Charlotte turned ONE this past Friday, and on Saturday we had a handful of friends, family and neighbors over. 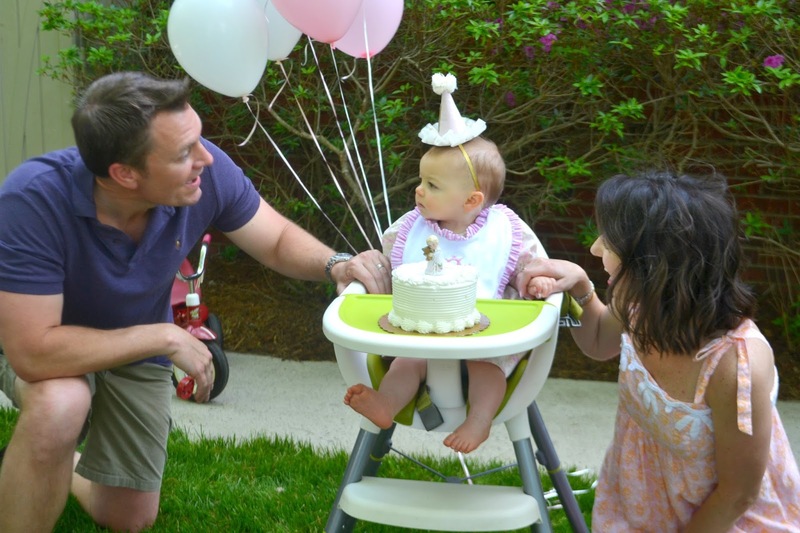 We kept this celebration really small compared to Camille's first birthday party (recap HERE) and it was just as enjoyable. 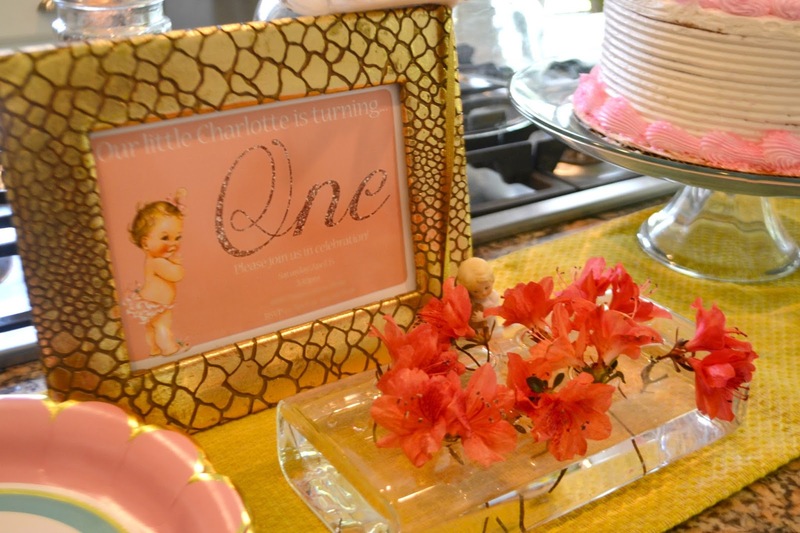 The vintage baby party invitation was just perfect for our sweet little Charchi-girl. She is so angelic and darling, just like that cherubic ruffled-bottom baby on it. 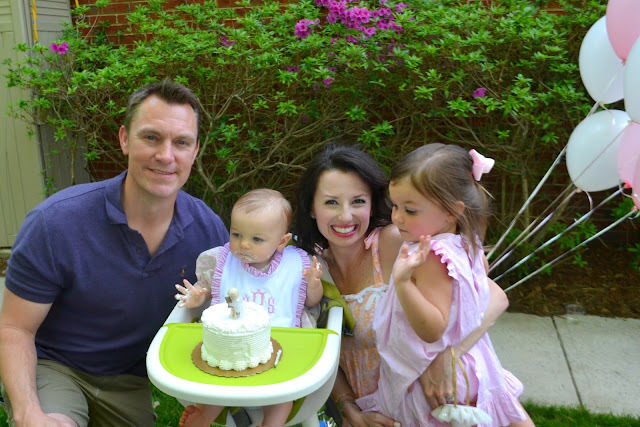 I used Harris Teeter for the layer cake and her smash cake (they give you this for free for your child's first birthday!) and it was delicious as always. The acrylic cake topper is reusable, so a total deal -- it's around $10. 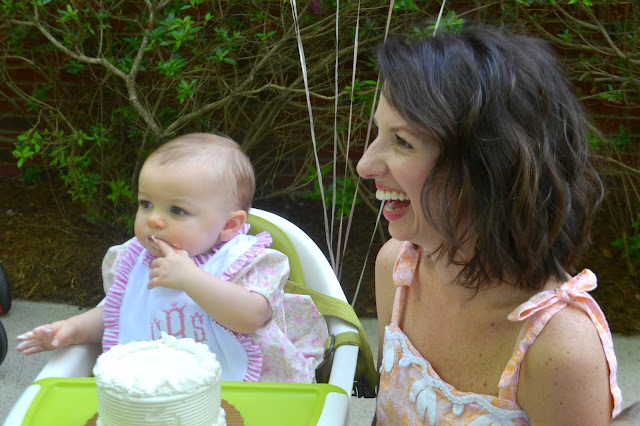 Charlotte wore a dress that my mom made and the sweetest little vintage-hued party hat (found HERE). I found she kept it on best if I put it around the back of her head instead of under her chin. I have a really neat story about that cake topper ... will share it Friday! She was gentle at first with her cake (it was her first taste of cake ever!) and then she dove RIGHT in. A girl who takes after her mama! Charlotte, you are a dream come true. Our whole family just loves you. Happy first birthday, baby girl! I can't get enough of her! those cake pics are hysterical. she really is a doll. love it.. Can't wait to hear the cake topper story. Love your dress too and your hair looks great that length. She really is a sweet little cherub! By the way, your hair looks AMAZING. Exactly how I want my hair to look but can never make happen ;) You look beautiful! 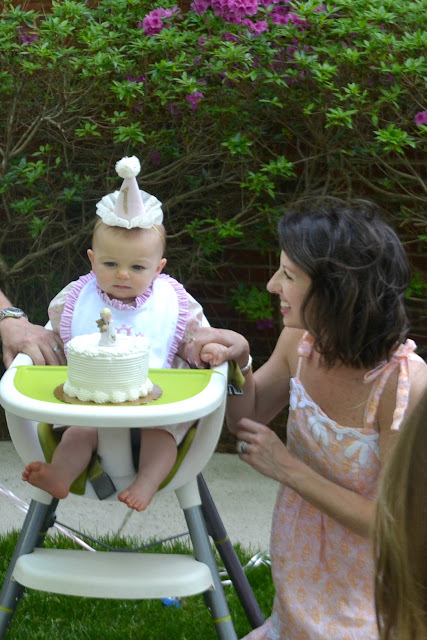 Happy first birthday to that gorgeous girl! I love all the vintage touches! Oh so sweet! I love her bib you all made for her too! Adorable! And I love your dress as well. Where is it from? so sweet! and your hair looks FABULOUS! loving the undone wavy look on this length! 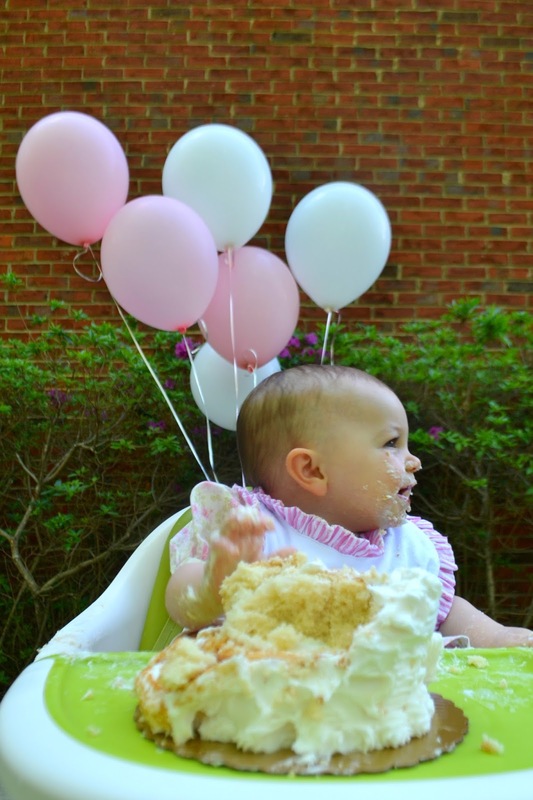 A sweet party for an even sweeter girl! Happy birthday Charlotte! Precious! I cannot believe she is ONE. How did that happen!? So cute! Happy birthday to your sweet girl! I loved that little hat!! 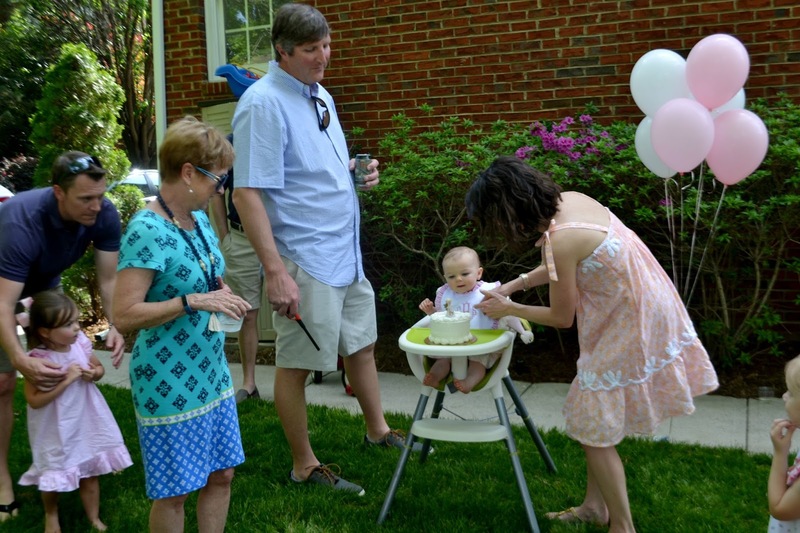 What a precious party for a beautiful girl! It looked just perfect, and you looked so pretty! I love your dress! First birthdays are so sweet. 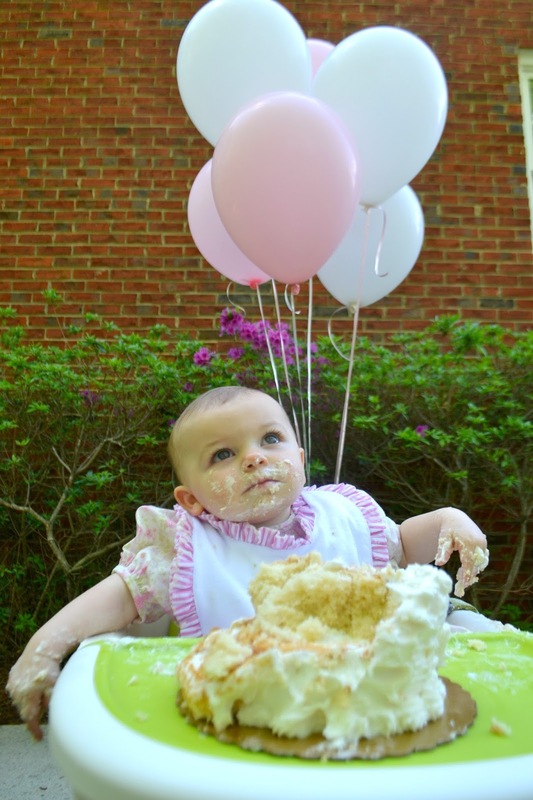 Looks like she loved her cake. You have a beautiful family! Happy Birthday, Charlotte! I love the invitation... so sweet. 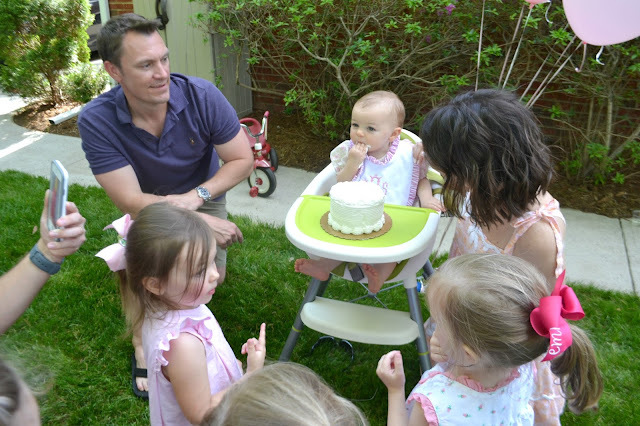 Can't believe our girls are 1 already. I love your dress! Where is it from? happy first birthday to your baby girl!!!! what an angel!!! Pleased to meet you! 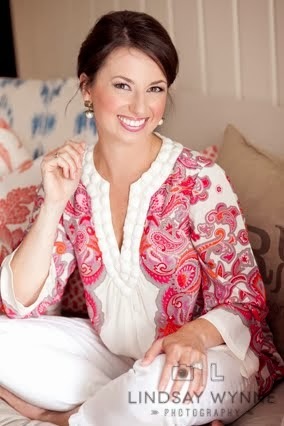 Join me as I diary my adventures - crafting, cooking, jewelry-making, shopping, traveling, and spending time with much-loved people that make me very, very happy. 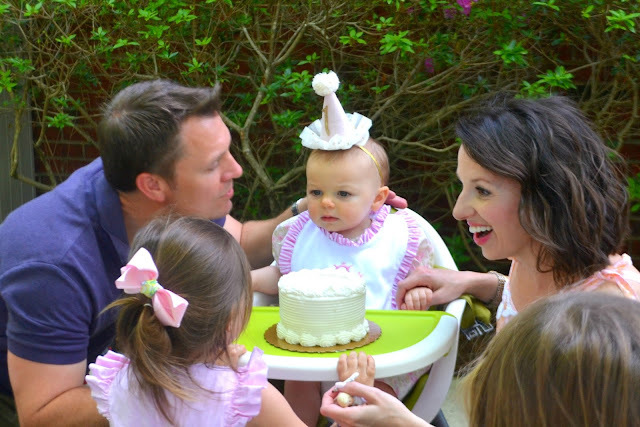 Five On Friday ::: Baby Charlotte is ONE! Disney Tips Part 2 ... From a Disney PLANNER! I Drank The Disney Kool-Aid. Dear Nolan... You are FOUR! recent instagram style | more summer styling on sale! can being an online scrapbooker be a thing? I don't know who I am anymore. mom hack: chick fil a.
lochlan is one, honey bear style! Say hello to my newest sponsor......6 Wilson and a winner!! Life Lately & 2 Months! Big Changes for Fried Pink Tomato! Your Ebates Invite From Me!